Sometimes I feel like I live in a bubble. It often takes a push to make me think that I'm blessed with so much, and there are others who just aren't as fortunate. Those moments make me realize that I take many things for granted. Sometimes the smallest items that I can't imagine living without are just out of reach for those who can't afford them. One of those items? A good thermometer. I can't imagine having a sick child and not having a thermometer to gauge the severity of his or her illness. I can't imagine calling our pediatrician's office and having to say, “I don't know.” when asked if my baby has a fever. 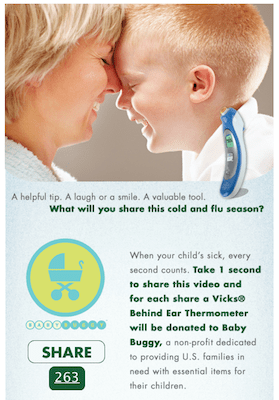 Vicks Behind Ear thermometer and Jessica Seinfeld’s Baby Buggy charity are asking for your help. There's a cute video on the Vicks Facebook page. For each “Share” of the video, a Vicks Behind Ear thermometer will be donated to Baby Buggy, which helps families in need obtain essential baby products. Share this 30-second video from the Vicks Facebook page; all it takes is clicking one button one time. I just shared it and it literally took all of 15 seconds complete the process. Your click will give one family much-needed thermometer. Ask your friends and family to share it and their single clicks will each give another family a Vicks Behind Ear thermometer. Can you imagine how many families can be helped if we all share the video and all of our Facebook friends do the same and all of their friends also share it? I must say, I'm a bit dismayed that there are under 300 shares as of today. Will you help me spread the word with a simple “Share” to help other families? 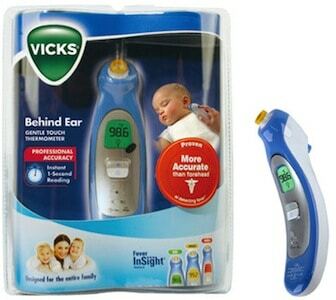 The Vicks Behind Ear thermometer is available at Walgreens, Target, Rite Aid and Walmart. I wrote this review while participating in a campaign by The Motherhood on behalf of Vicks. I was compensated for this post.